Despite a short story, GUN delivers a fully engaging and intense depiction of how brutal the West really was. "Explore the brutality that was the West." Those famous words clearly describe Gun, the latest game from Tony Hawk developer Neversoft. Admittedly, I was skeptical about the fact that the skateboarding genius would be venturing into an entirely different world, and genre for that matter, to make a new type of game. The outcome, however, is one of pure brilliance and remarkable storytelling. Gun starts out with a young hunter named Colton White (voiced by Thomas Jane), who goes out on a hunting trip with his "supposed" father Ned, who is voiced brilliantly by Kris Kristofferson. While learning the gaming basics during your hunting campaign, Colton soon finds himself aboard a steamboat being bombarded by dozens of vicious soliders trying to kill him to locate a hidden treasure aboard the ship. While on the ship, Ned unwillingly tells Colton that he isn't his real father right before he plunges into the deep. From that point on, the story follows Colton as he ventures through the Wild West in search of answers to his past, all the while exacting revenge on the people responsible for Ned's death. After learning how to ride a horse and trample enemies while on it, you can than venture almost anywhere you want in the huge world. Although there are only two towns within the game, Dodge City and Empire City, the world is full of other explorable places such as caves, Indian forts, trading camps, and more. Empire City, the larger of the two, definitely has more to look at than Dodge, which consists of around ten different buildings. It is kind of a letdown to see that the massive world of Gun is only limited to about 30% actual places where you can visit and interact. But I digress. After finding your way to Dodge, Colton learns how to master his gun by using a skill called Quickdraw, which essentially slows down time for you to get that perfect shot on your opponent. Next to your health bar, there is a Quickdraw bar, which depletes when in use, but will recharge when you hit or kill an enemy. Quickdraw is basically the main combat mechanic in the game, as when you are using it, it is nearly impossible to get hit, and it can be used in tight spots to avoid heavy damage. Besides your gun, Colton has a bevy of weapons at his disposal. Throughout the story, Colton will receive these weapons by completing missions. Swords, sniper rifles, shotgun, pistols and even bows will all be added to your inventory. These weapons come fast, and by the end of the game, Colton can have amassed nearly twenty different weapons to choose from. Despite the fact Colton has that many weapons, the chance to use more than half of them rarely comes into play. Once you receive your first rifle, two missions later you will get a brand new one, which of course is more enhanced than the last one. Thus, this makes your other rifle inferior, yet you can still choose it in the inventory menu, which boggles my mind. If you don't feel like going gung-ho into the thick of battle with your guns, there is always your trusty hatchet, sword or whatever melee weapon you have at that point, which can be used in a gruesome, yet satisfying matter. The missions in the game are very spread out. They will range from protecting "Chinamen" working on a bridge from Indians, to taking out bandits causing havoc in the city. Each mission has its own little reward, and no two missions are ever alike. Some missions are as easy as going to a certain place and finding a guy, while some have you taking out every guy in the area. The main story, however, is very short. Completion can take around 7 to 20 hours, depending on how long it takes you to complete certain missions. If you want to get more out of the game, there are plenty of side missions to ease your hunger pains. Wanted missions (which has you tracking down criminals for cash), hunting missions (which has you killing a certain type of animal with only Indian weapons) and even poker tournaments (which has you competing in Texas Hold Em' against heavily trained AI opponents) are at your disposal for easy money making, stat building and time consuming fun. The graphics seems to take a downward spiral however in the game. Although they look good by today's standards, being on a next-gen system with blurry locales and buggy, choppy cut scenes just won't cut it. With some more axle grease, I bet the game could have looked spectacular. The story is definitely one of the highlights of the game. Although admittedly short, the game showcases just how lawless and brutal the Wild West truly was. Almost everyone Colton runs into has distaste for him, and to not reveal any of the story, nothing else will be said. The story finds Colton doing various missions and visiting different places in order to find truth behind Ned's death. What treasure was on that boat? Did they kill Ned for that treasure? All of these questions are answered throughout the campaign. Besides the heavily toted story, the sound stands out as the main point in Gun. Kris Kristofferson and Thomas Jane are definitely the standouts as main characters Ned and Colton White. Both portray their characters with expert finesse and seriousness. Every weapon also had an accurate sound and never has a game had such outstanding achievements in the sound effects department. Even the music in the game is top notch, speeding up for those intense gun battles, and slowing down for those nice strolls through town. 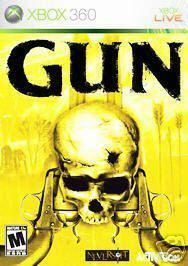 Everything about Gun fits together so beautifully and completely engages the player in one well oiled game. Although the game itself was rather short, it was a thrilling ride while it lasted.